White flowers and a white arbor brighten the grey wall that encloses my first “garden room”. Our neighbor’s grey garage wall sits near the property line of our garden. I wanted some white to brighten the area. So, as is now the tradition with Ted and me, after enjoying a nice meal together, I ask him if he has any arbor ideas and he pulls out his paper napkin and proceeds to sketch the design. The biggest claim to fame that this arbor has is as a photo op. Ten years ago, I hosted a wedding shower for my friend Dell and later she was married in our home. I have an enlarged, framed picture of 26 friends sitting on and standing around this arbor. Behind the arbor, to the left is smoke bush, cotinus coggygria. After a few years of caring for the garden, the very large elm tree that shades the house, also came to shade the smoke bush. I dug out the smoke bush. The hydrangea and dogwoods flourished. Change is the one constant in a garden. This arbor is very sturdy. I first planted it with a kiwi vine, with dreams of harvesting nice plump kiwis. The kiwis, if you can count 2 kiwis as a harvest, were like big marbles. After a few years I removed the vine. I used to have Hops on this arbor. Hop die back every winter, but in the spring grow so fast. They quickly cover an arbor. This rose is Reine de Victoria. Gloria, I had to enlarge and sigh and ooh and ahh over your garden. The arbor looks exactly like it was meant for this spot. Don't you love the height that arbors provide? Years ago during my dilettante days, I couldn't put my finger on what was missing from my garden. After much contemplation as well as research, it dawned on me. The vertical element... Anyway, it looks like you've got a pergola and patio in the back area, a good balance. Stay warm! That is a very nice arbor! never seen one like it either. I have made a few arbors but nothing that detailed. It does fit the surroundings very well too. 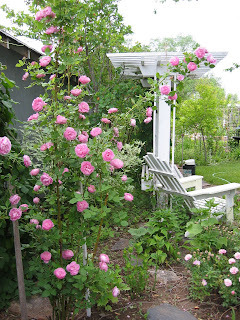 Who would have thought gardeners (and cyberfriends) from Australia and South Dakota would have so much in common? I currently have smoke bushes and love them but am watching with alarm as one grows so big and not looking so great. I am also a great fan of garden rooms, next to the house and in the garden, as many as possible. I have dogwood, a deciduous one. I can't have hydrangas because they're too thirsty. But they were in the garden many years ago. I also had a kiwi vine for many years but got rid of it. I used to have quite a lot of fruit which the birds would eat but eventually they (boy and girl) got weak and unhappy due to lack of water, so they were removed to make room for other plants that would be happy in this tough (but loving) environment. Now, instead of hops like you, i have a grapevine that seems very happy. Lots of grapes but they won't probably won't get ripe enough for us to eat. So instead I enjoy watching the birds enjoy them. Gloria, another beautiful project in your garden. That husband of yours is quite the artist. When you are looking at the second picture, what are the white legs in the background. I enlarged the picture, but couldn't tell? Is it another arbour? What a beautiful arbor! I can see why it would be used in photos. I agree with your comment "change is one constant in gardening." So true! To Grace and Deborah - Yes, you have sharp eyes. There are 3 different arbors or pergolas in the garden. Plus the back perimeter is enclosed by a 7 foot arbor topped structure. I plan to show all the arbors. 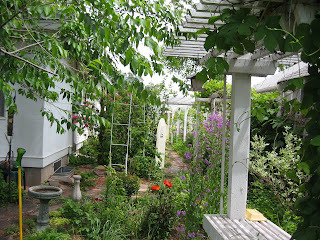 My favorite is a long arbor that turns the side yard into a "secret garden"
How lovely! 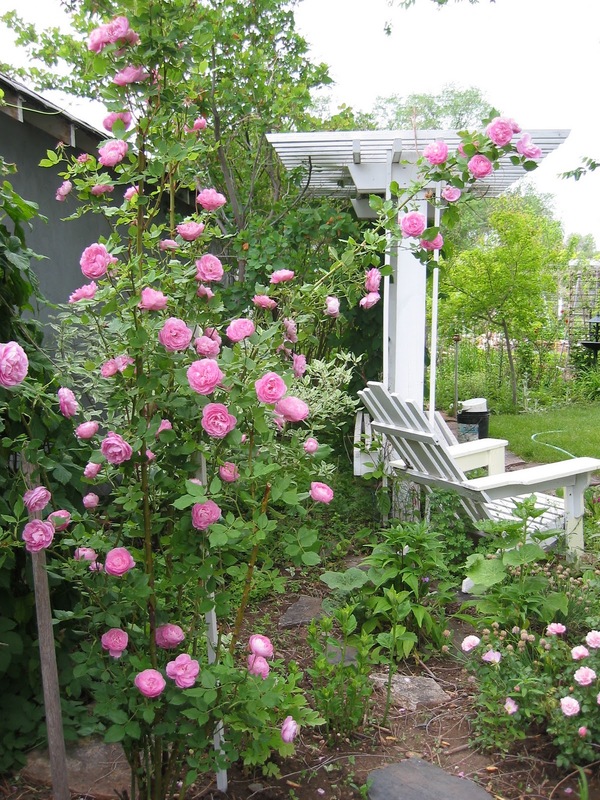 Grace is right... these arbors add height and beauty to your pretty gardens. It is a most beautiful arbor. I love the white. Bummer on the kiwi but hops probably provides more than enough interest. The smoke tree next to it is great too.